I finally got the other cat to cooperate! This is Rorschach, who belongs to one of the other roommates, and was not best pleased to find me sticking a book under his head. The book is Derelict, by L. J. Cohen. 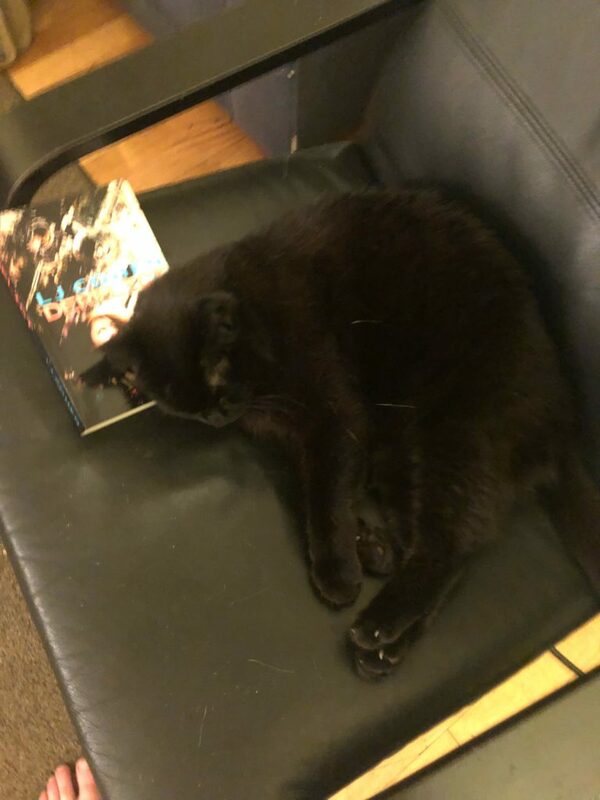 This entry was posted in Cats Sleep on SFF and tagged Kit M. Harding by Mike Glyer. Bookmark the permalink. I’m definitely getting a “that was not what I had planned to rest on” vibe here. I would not like someone sticking any object under my head as I rested. Sleep is sacred to cats, and me. Poor Rorschach! Clearly would have preferred a proper classic, like The Book of Night with Moon. I’m admiring the advanced catting skill involved in the black cat sitting on a black chair. If you mistakenly start to sit on him, he gets all kinds of points from the other cats. Lauowolf, hah! That’s only advanced-intermediate catting. My black cat Dante’s favorite napping spot is in the middle of a very fuzzy black throw (we call it “the bear”), where he is COMPLETELY invisible when his eyes are closed…. When I ended up in hospital dying repeatedly from very serious brain trauma, the Hospital told The City Animal Control Officer to find homes for my felines as I was not expected to live (this I all learned in the email she later sent me). My landlord let her in, she looked and never saw the two smalls. (The eighteen year old cat ironically she found was dying from an undiagnosed brain tumour so she had him put to sleep.) To this day, they can hide well enough, Freya and Taliesin, that visitors never see them. @Cat Eldridge,I’m sorry your elder cat died while you were in the hospital, but I’m glad your two younger cats are still with you. It’s good that they’re champion hiders. Cassy B says to me that I’m sorry your elder cat died while you were in the hospital, but I’m glad your two younger cats are still with you. It’s good that they’re champion hiders. Thanks. I’d pose ‘em on a book that they don’t sleep on such things, much preferring either their now well a decade over cat tree or the bed. Particularly the bed if possible.